Factors that influence learning among health care professional include a) the medical knowledge explosion; b) specialty society interest in Continuing Education (CE); c) the use of CE “credits” to document maintenance of knowledge and competence; and d) a large interest by pharmaceutical and other commercial interests that recognize CE as a means to influence physician practice. Regulatory forces also exist. Specifically, licensing and certification boards now require proof of participation in CE on a regular basis; the process of recertification has given rise to a more active and effective form of continuing education. Education is one means to effect performance change and improve practice outcomes, thereby achieving translation of knowledge into practice. In the current context of relatively autonomous practice, it may afford the only means at the implementer’s disposal to effect change. Green’s PRECEDE model provides a highly useful construct to understand, develop, and deploy effective educational interventions. The model incorporates elements characterized as predisposing (e.g., mailed guidelines), enabling (e.g., patient education materials), and reinforcing (e.g., reminders). Putting together these characteristics and the process through which the learner adheres to a new practice (Pathman’s awareness/adherence model) provides a broad framework to strategize the deployment of educational interventions. First, several systematic reviews have identified that most didactic conferences or mailed materials, employing only one technique, are infrequent producers of change in performance. Second, if learners are aware of a new finding or guideline but do not agree with it, small group learning or increased interactivity in the conference setting exposes the learner to peer influence. This influence is a strong predictor of increased discussion and possible consensus. Third, if the issue is one of adoption of a new manual or communication skill, or a complex care algorithm, more in-depth workshops or interactive, online learning experiences may facilitate the change. Finally, once the process has been adopted, system-based interventions, such as reminders or audit and feedback, may be considered to facilitate sustainability. What educational interventions can we use to effect knowledge translation? Educational events for relatively large numbers of learners are commonplace, although the evidence indicates that these types of interventions produce little to no performance change if they are purely didactic. 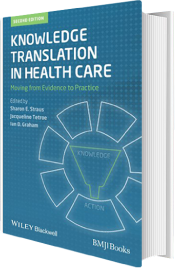 However, there are strategies within the large group model to increase impact on performance and health care outcomes: using a more refined and objective needs assessment; increasing interactivity; and using a variety of educational methods. There is ample evidence that not only the needs of learners but also that of their patients or health care system should drive CE content. However, considering only system or patient needs and ignoring health professionals’ learning styles and habits misses an understanding of the learning process and may fail to change professional performance. In contrast, CE planners frequently use solely subjective needs assessments despite evidence that clinicians may be poor self-assessors and that objectively determined gaps may more closely link the CE process to demonstrable outcomes. Subjective needs assessment strategies include questionnaires, focus groups, structured individual interviews and diaries or log books. To offset the self-assessment deficiencies inherent in these methods and to create a more balanced needs assessment strategy, objective tools can be used including standardized assessments of knowledge and/or skills, chart audits, peer review, observation of health professional practice, and reports of practice patterns and physician performance data. Several strategies can enhance the delivery of effective formal, large-group CE, including increasing the interactivity of the sessions, employing multiple methods within the framework of the activity, and using other strategies to increase the reach and impact. Third, CE activities may use clinical scenarios and vignettes in an attempt to increase relevance and applicability of educational material. There is fairly clear evidence that interactivity has an impact on performance change. Small group learning is one of many innovations created by the growth in problem-based learning methods in undergraduate education. This method uses groups of 5–10 individuals and employs many of the principles of effective CE (case vignettes, relevant group discussion, peer interaction, and high degree of interactivity). Education can also occur through online formats (e.g., webcasts), however they must be interactive in order to engage the learner and improve impact. Online communities of practice are another potential KT intervention. Motivated by common interests and issues, groups of learners experience audio conferences, case discussions, and follow up or support by electronic means using reminders, cases, and other means to promote networking and consulting among peers. Some health professionals possess a learning style preference or logistical need for more self-directed choices. These include traditional sources, such as textbooks, that provide clinical information. Important developments to aid self-directed learning have included the advent of printed or computerized self-assessment programs, which provide learners with feedback about their competence as they read materials and answer questions. What are some current and future trends in CE? Changes in the construct of “CE” from a traditional understanding of CE as an information transfer vehicle to a more complete understanding of the learning process and the complex health care world. An increasing focus on health care outcomes and performance using performance measures to plan and evaluate CE. New and emerging disease states demand the need for rapid-response educational technologies in the face of serious pandemics such as, pan-flu and bioterrorism issues. A greater understanding that the traditional physician-focused CE model requires re-thinking and modification, given increasingly complex health care settings and the recognition that quality of care is clearly a multi-professional team activity. Improved chronic disease management to help health care professionals treat the many comorbidities present in an aging population.